Shivaay and Tia’s Roka happens with the family’s blessings and happiness. He thinks of the coincidence that made Anika come between his Roka ceremony and wear the Roka chunri, which was specially crafted for Tia. Dadi performs the Roka rituals with Tia. Shivaay can’t take his eyes off Anika. He looks at her while Tia wears the Roka chunri. Rudra tells Omkara that Shivaay’s Roka happened with the stranger. He feels they have some connection. Anika tells Khanna that she has come to get her file, as she has to go for some interview. Omkara and Rudra see Shivaay’s attention and eyes just on Anika and find it strange. Dadi and Omkara shout to Shivaay, who is lost in Anika’s eyes. Shivay’s heart tends towards Anika, which leaves a mesmerizing first impression on Shivaay. Dadi gets happy that Shivay is marrying Tia. Anika and Shivay steal a glimpse. Anika gets her file and leaves. Omkara and Rudra tease Shivay about his evident interest in Anika. Gauri and Sahil have cute fights at home. 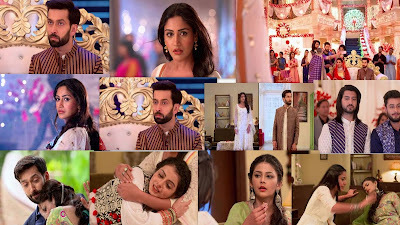 Anika returns home and reveals the chunri incident to them. Gauri sings and dances to tease Anika. Sahil asks Anika if her Roka happened in their absence. 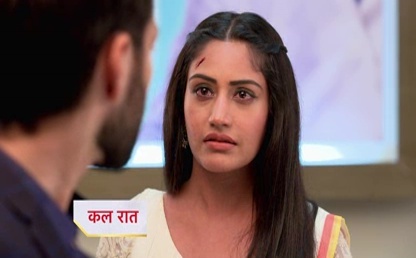 Anika tells Gauri that it was Shivaay and Tia’s roka. She tells how she accidentally landed in the Roka and got the chunri over her head. Gauri wishes Anika gets married soon. Omkara and Rudra too pull Shivaay’s leg about Anika, and sideline Tia. Shivaay and Anika get enough of their drama. Shivaay asks Priyanka to decide whatever she wants. He tells her that he can buy anything for her. She gets emotional and asks him to think for himself as well. She asks him to buy a ring for Tia. He doesn’t want to get involved in marriage arrangements, which shows he isn’t much happy. Priyanka doubts that he isn’t happy. He tells her that he is happy since Priyanka is getting married to Tia’s brother. Shivaay hides that he is compromising just for Priyanka’s happiness. He gets sad thinking Priyanka will go away after marriage. He wants to make the most of the time till Priyanka stays with them. She asks him not to get emotional thinking of her leaving. Anika wishes to get the job. She faces the rejection once again. She gets in pressure. Gauri asks her if she has any problem. Anika tells Gauri that she won’t lose hope and courage. She asks Gauri not to take tension about her problems and let her do her duties. She asks Gauri to focus on her studies. Gauri wants to know what’s bothering Anika. She wishes Anika gets rid of all the difficulties in life. Anika meets Priyanka, who comes home to hire her as the wedding planner. Priyanka tells her that she has seen her work and liked it too. She tells Anika that she wants to show her work to Shivay too. She asks Anika to manage all the wedding arrangements for her weddings. Anika gets much happy and makes Priyanka feel comfortable. She prepares a special dosa for Priyanka. Priyanka feels affection while talking to her. Priyanka consumes the dosa and gets allergic. She faints down shocking Anika. Anika doesn’t understand the reason and tries to help her. Shivay and Anika meet again and have a big clash in Hospital Both Question on Each-Other's Upbringing.